HTML5 provides developers the potential to develop rich internet applications. HTML5 turns any website into a Web App. HTML5 web apps are not only limited to desktop but are also accessible on modern mobile and tablets as well. But what if you want the same experience on your desktop too i.e. not to open web browser and visit a particular URL for the web app but to click an icon on desktop and run it offline like the other native apps. There are several options available to a developer to provide such functionality. Some great tools with such functionality are Pokki and Chrome Package Apps and Mozilla XUL Runner. Pokki and Chrome not only allow you to develop desktop HTML5 apps but also provide a marketplace to distribute them for desktop. One another tool is Node-Webkit which is going to be discussed in this blog post. Node-Webkit is a run-time based on Chromium and Node.js. 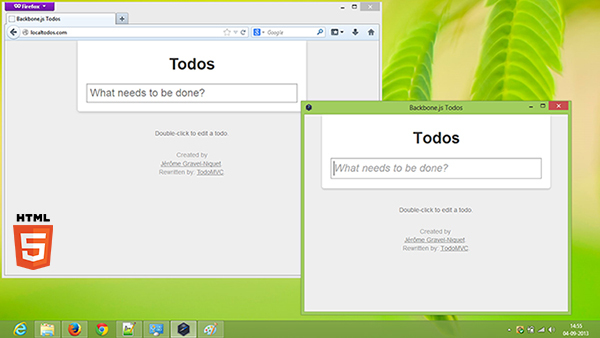 It allows you to package your HTML5 apps and games for Windows, Mac and Linux. Why do we like Node-WebKit?? It packages your app for Windows, Linux and Mac such that they don’t need any dependencies to execute. It supports Node.js. You can build amazing apps and games using the Node.js Modules. You are not limited to internal node.js modules but can also use any existing node.js module. here the name is the name of your app and main is the file that will be loaded on startup of your applications. Checkout their wiki links to learn more .Hope this article helped you. If you have any further suggestions or know about any other tools like Node-WebKit, please do share it with us support@shephertz.com . I think it should be the other way. oops! we did a small mistake but we have corrected it. I think the last step (6) has the commands flipped. Should be the first one the windows command and the second the linux? thanks! we have corrected it.